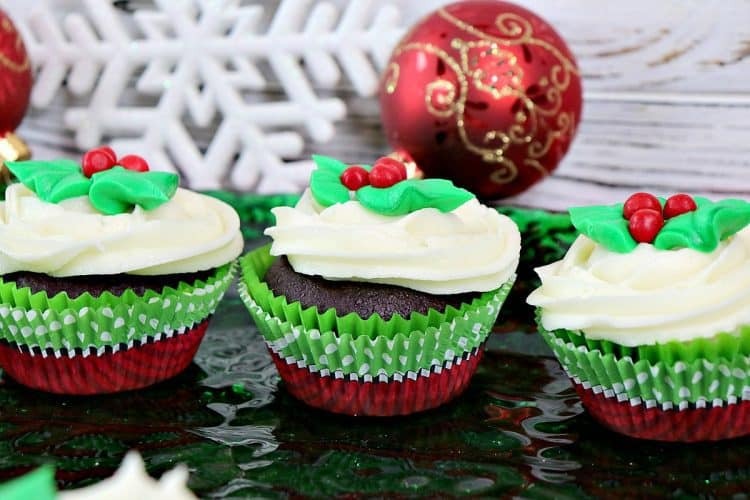 These festive and charming Holly Berry Chocolate Peppermint Cupcakes are sure to be a hit with your family and friends this holiday season! 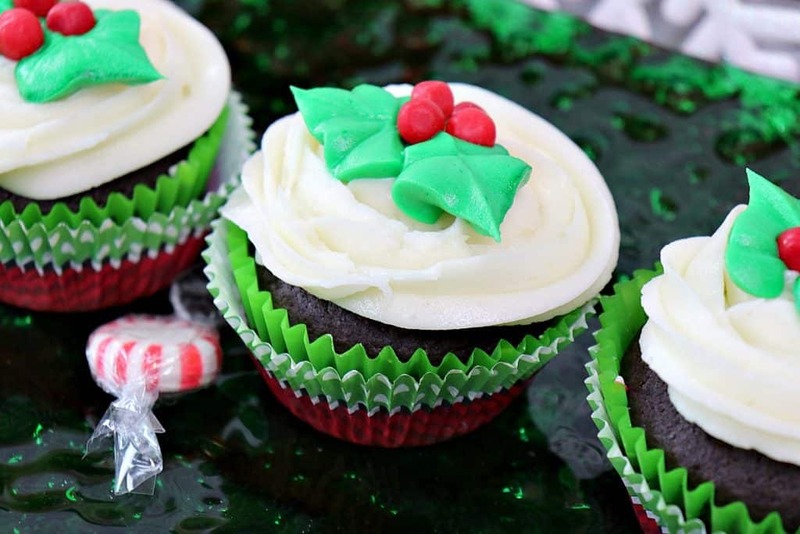 **Please Note – The printable recipe card with detailed instructions and complete ingredient measurements for making Holly Berry Chocolate Peppermint Cupcakes is available near the end of this post. 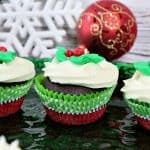 **The following affiliate links are some suggested products I’ve chosen that will aid you in the making and serving of this recipe for Festive Holly Berry Chocolate Peppermint Cupcakes with Peppermint Buttercream Frosting if needed. By clicking on the item photo, you’ll be taken directly to Amazon.com if you’re interested in purchasing any of these products. You are in no way required to do so, and you will not be charged in any way unless you decide to purchase one of these products through Amazon.com. As an Amazon Associate, I earn from qualifying purchases. Below is the printable recipe card for today’s Holly Berry Chocolate Peppermint Cupcakes with Peppermint Buttercream Frosting. If you’ve enjoyed this recipe and look forward to making it (or have already made it), I’d appreciate if you’d take a moment to give it some feedback by way of stars near the comment section at the end of this post. Thank you so much! Prepare a cupcake tin with cupcake liners which have been lightly sprayed with baking spray. Set aside. In a large bowl, whisk together the flour, sugar, cocoa powder, baking powder, baking soda, salt, and espresso powder. Set aside. In a medium bowl, whisk together the milk, oil, egg, and vanilla. Use a stand mixer or hand mixer to slowly incorporate the wet ingredients into the dry ingredients. Slowly add the hot coffee to the batter and blend until just combined. Fill the prepared cupcake liners ½ full of batter and bake in a preheated oven for 12-15 minutes, or until a toothpick inserted in the center of a cupcake comes out clean. Cool completely. Use a small spoon or melon baller to scoop out a small well in the center of each baked cupcake. Fill each well with the crushed peppermint candy. In a large bowl, blend the softened butter, confectioners sugar, and peppermint extract on low. As needed add milk, a little at a time, until you achieve your desired consistency for piping. Soft, but still holds shape when piping. Reserve approximately ½ cup of the peppermint buttercream frosting and color it green with a few drops of the gel food color. Fit a large piping bag with the large star decorating tip and fill with the white peppermint buttercream. 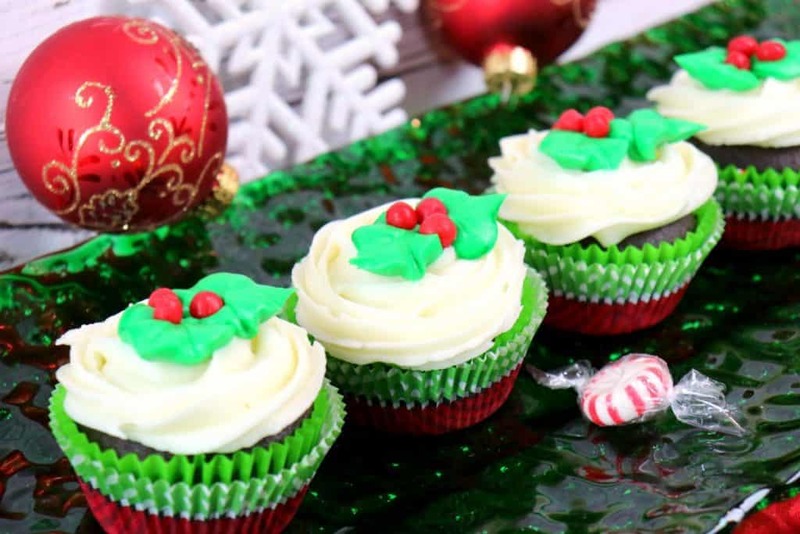 Starting in the center of each peppermint filled cupcake, pipe the frosting in a circular motion working outwards to cover the top of each cupcake. Add the green peppermint buttercream to a small piping bag which has been fitted with the large leaf decorating tip. Pipe two leaves onto each frosted white cupcake and finish by adding 3 red-hot candies to complete the holly berry design. I sincerely hope you’ve enjoyed today’s recipe for Festive Holly Berry Chocolate Peppermint Cupcakes with Peppermint Buttercream as much as I’ve enjoyed bringing it to you! These are so pretty and so simple. Even me, the worst cupcake decorator in the world, we able to make them look pretty! You would knock them out of the park! These are perfect for the holiday season and what kid (big or little) wouldn’t love some peppermint candy in the center! They look so festive and pretty too! Not only are they adorable, but they are scrumptious. The peppermint buttercream is amazing! Thanks, Sara! So happy that you think so!! 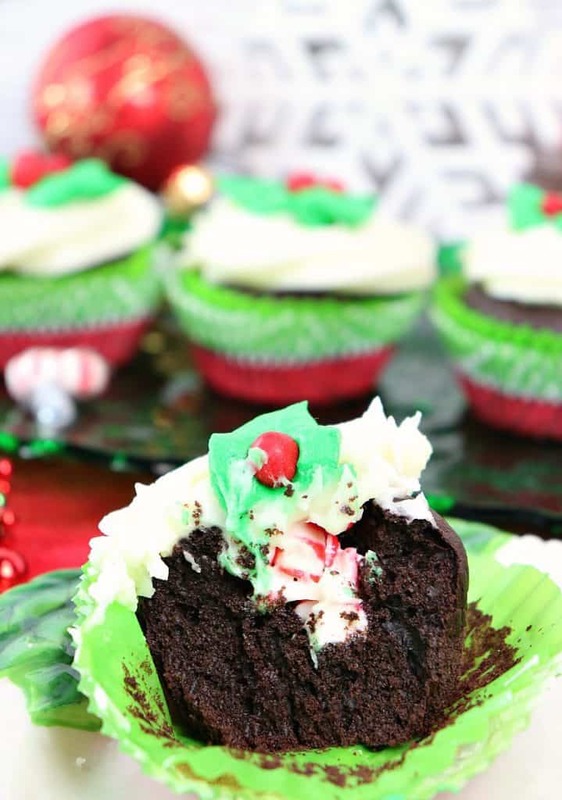 Chocolate peppermint cupcakes are the best! These are so festive and cute!!! Mint and chocolate is my favorite holiday baking combination! I can NOT wait to make these cupcakes. They look amazing!! Thank you, Elizabeth! I know you’ll love these! Thanks for commenting! These are so fun for the holidays!! Love them! 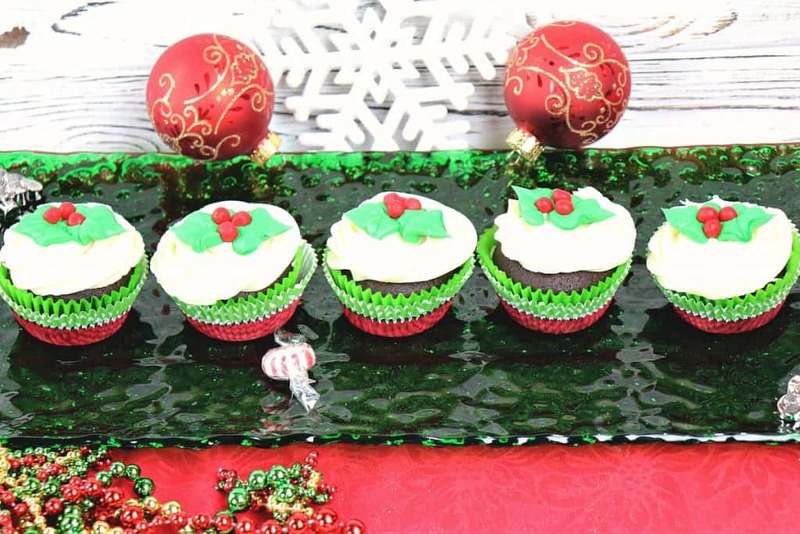 These cupcakes are so fun and festive for Christmas! Chocolate and mint are such a great flavor combination too!